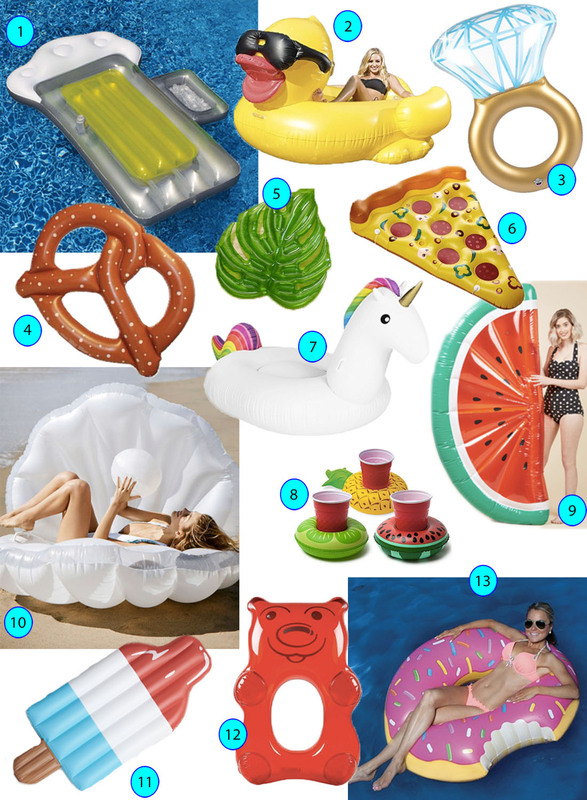 For someone who has never had a pool or lived in a place that had more than one season of pool-weather, I sure am obsessed with pool floaties. Is that a word - floatie? Our neighborhood gang used to ride bikes down to Target and stand for hours in the recreation aisle, just staring at the pool toys (usually consisting of a silver rectangular floatie and maybe a noodle or two), pretending we had the money and the reason to buy one. I don't know if 8 year old LuRuSo could have handled the selection of floatie fun that is available today. Animals (Rainbow unicorn? Check! ), munchies (Junk food? Fruit? Check! Check! ), nature (Clam Shell? Why not!? ), and even a diamond ring - all floatable. There are even matching floaties for your beverages. It's like Mommy & Me dresses, but for your beer. So grab an air filled pretzel, duckie, or donut, and get ready for all your cares to float away.